I really love all Xiaomi products I’ve tested so far. Their lighting products are not exceptions and I’m using a lot of them in my house. The Xiaomi Mijia Philips LED ceiling lamp is another product coming from the partnership between Xiaomi and Philips, so I expected this would become the primary light in my living room. Unfortunately, it failed to impress me. I was really excited after installing and switching on the lamp, it looks as bright as I expected. Then, I proceeded to install the Mi Home app to control the light. Here, a terrible issue comes up. I successfully connected to the lamp but when I tapped on it within the app, nothing happened. The app only shows me if the lamp is on or off, and there is nothing else I can do. This is a huge disappointment because I expected I could use the app to adjust brightness, color temperature, or change to the moonlight mode (only the center of the lamp lights up). It seems like Xiaomi disabled the app control and our only option is to buy the remote control which costs extra $20. 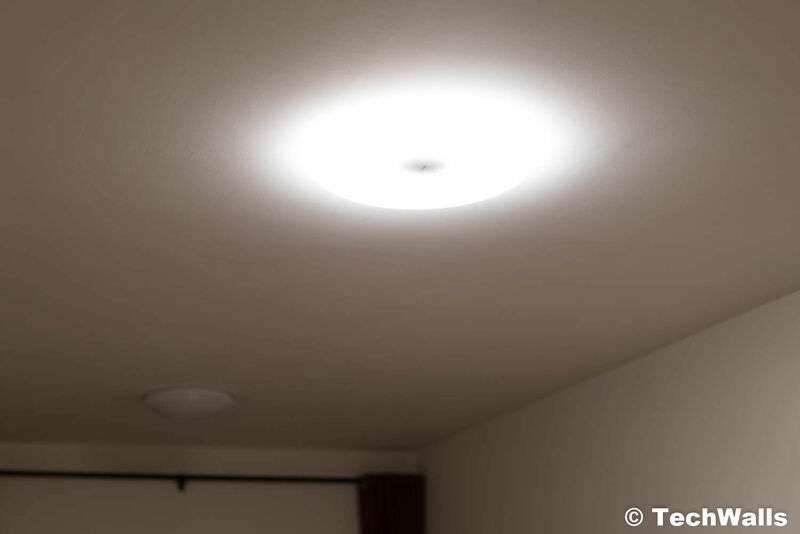 At the moment, this MiJia ceiling lamp works just like an ordinary lamp. I just can switch among some preset lighting modes by turning on and off the lamp. I gave it a try a few months later and the Mi Home app works perfectly now. I can use it to adjust power the lamp on/off, adjust lighting, and check the humid and room temperature (the remote control is required). Although the app can do anything, I still recommend buying the Xiaomi’s remote control since you can stick it on the wall and control the lamp easily. You can check out the control and how to set it up in the video below. Is not Google Home Compatible? Can be used with classical switch? It return to last state after power on? Sure, I’m using it with my old switch. It will always save the previous state. I’m using both the app and remote control, there is almost no delay. Hello, have this lamp mounted and try to connect with the MiHome App. When the lamp is updated, the lamp flashes in the middle and at 65% it stops flashing. The% run very slowly up to 100% and the time is too much. Wifi of the lamp is off. Now the lamp has to be reset. Wifi is forthcoming. The connection to the Mihome must be restarted. Why? Can someone help me. Why is Wifi interrupted? What am I doing wrong. Can not add to the mi home app..
What was wrong? Have you tried changing to China server? What’s the ceiling mounting process like? It’s simple, just like any other ceiling lamp. You mount the base onto the ceiling first and then attach the light. I am not satisfied with my experience with this lamp either. Even with the Mi Home app set to the China server it can’t connect to the lamp. There’s no response on their forums or support to a simple question. If they are selling international they should have support documents in several languages. And you shouldn’t have to “wait several months” for a product to work! I didn’t have any problem connecting it to the app. Have you reset the lamp and try again? If resetting is turning it off and on 5 times within 3 seconds I have tried that but it had no effect. hello! just bought the light, any idea how to connect it to the app at all? You just need to install the Mi Home app and add the lamp. Is it possible to connect this lamp to another server (not China)? Is anyone able to use this Phillip E27 without selecting China Mailnand Server? I can only find this Phillips E27 if the connecting server is China Mainland, however, others products like Mi Roborock is now unable to use the China Mainland server, seems Xiaomi is not doing a great job supporting all its products worldwide, Australians consumers lacks server and product support locally. Xiaomi and Phillips needs to rectify this for consumers outside China mainland.